Will it be third time lucky for this powerful melodic rock band from Leicestershire? 1993 saw the release of the band’s debut album ‘So Far So Bad’, but after a follow-up release ‘Spark To A Flame’ the death of drummer Karl Bee in a motorbike accident in 2001 drew down the curtain on Act One. 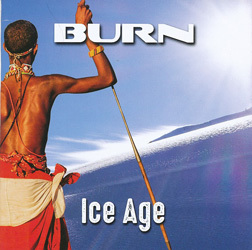 A reboot in 2005 resulted in the release two years later of ‘Global Warning’, but a year after that the band split once more. But the old adage that you can’t keep a good band down is as true as the day is long and, in 2012, Burn MkIII began to see the light of day. This current line-up sees founder members Barney (keyboards) and Mark (bass) Stackhouse with guitarist Phil Hammond from the band’s second incarnation alongside new-to-the-fold vocalist Steve Newman and guitarist Chris Green. Unfashionably for a band in the early Nineties, Burn inhabit the territory of big chords and big choruses which, back in the early days of Nirvana and Pearl Jam, may well have been a distinct drawback (although didn’t stop ‘So Far So Bad’ from copping a 5K review). But with bands like Inglorious making people sit up and listen, there’s no time like the present to unleash ‘Ice Age’, a dynamic, versatile album chock full of memorable melodies and chest-swelling anthemic chorus lines. With more hooks than Christian Grey’s back room, classy, catchy songs are the order of the day, and the pugilistic riffing of ‘Punishment Of Lust’ and hard-nosed attitude of ‘Irontown’ sit comfortably beside slow-burners like ‘The Girl Who Wanted Everything’. The songs are beautifully crafted and executed, and across the board you’ve got superb vocal delivery from Newman and some jaw-dropping guitar antics by Green (check out his solo in ‘Sink Together’), all of which add to the excitement of what is an extraordinarily accessible album. If I wanted to be a tad grumpy, I’d suggest it might have been better to have dropped a couple of songs and slimmed ‘Ice Age’ down to a fifty-minute powerhouse; those of us with a limited attention span might find that, at an hour-plus, the album does tend to outstay its welcome a little towards the end. But hey, why be grumpy? Crank it up and enjoy.